Oct. 20 at the Pennsylvania Military Museum. The music never stops emerging from the hidden places right before our eyes. I’m a teacher by day — a 10th grade English teacher at Bellefonte Area High School — and I have the pleasure of working with hundreds of really great kids every day, some of whom are musicians, and some of whom are in bands that gig in our area. One of those bands is Sauce, a sweet five-piece improv band that is playing the 2nd annual Rowe’s Research Runners One Mile Walk/Run/Roll at the Pennsylvania Military Museum at 2 p.m. Oct. 20, with a rain date of Oct. 21. 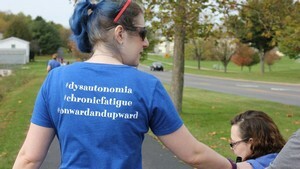 It’s a charity run designed to raise money for chronic fatigue syndrome, Dysautonomia and related illnesses.